Primary purpose of the site is to pass on information to Mr. Gilliard’s current instrumental and general music students at Thomas Johnson Middle School. For those who are former students as well as folks who aren’t his students, it’s an additional music education resource site . It’s hoped that all the resources here would help everyone visiting to become better musicians. 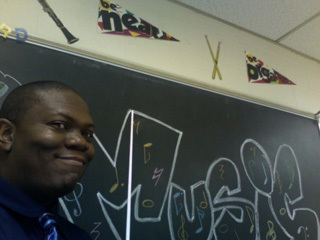 Mr. Kerry Gilliard is the Music Department Chairman at Thomas Johnson Middle School in Lanham, Maryland. Bachelor of Science, Music Education, Bowie State University, 2001. Master of Arts in Teaching with Emphasis on Educational Leadership, Grand Canyon University, 2013. Former Assistant Band Director, Student-Staff Liaison and Student Director-Arranger, Bowie State University Symphony of Soul Marching, Pep and Concert Band. Primary Instrument(s) played: Saxophone (28 years), Piano (21+ years), Other instruments played: Recorder, Flute, Clarinet, Baritone & Euphonium, Trumpet, a little Trombone. Currently teaching himself Bassoon (I *love* this instrument) and re-teaching himself Guitar. Mr. Gilliard’s work e-mail address is available on the faculty page at the Thomas Johnson Middle School Website: http://www.pgcps.org/~tjohnson/ . He can also be contacted at kg at mrgilliardmusic dot com. You can read his extended biography here. If you’re interested in purchasing or commissioning a composition, please visit 7th Letter Music. If you have an employment or professional opportunity for him, please visit and contact him at his online portfolio.